Effective risk management is key to achieving the strategic and operational objectives of Ferrovial and to detecting new business opportunities and competitive edges. 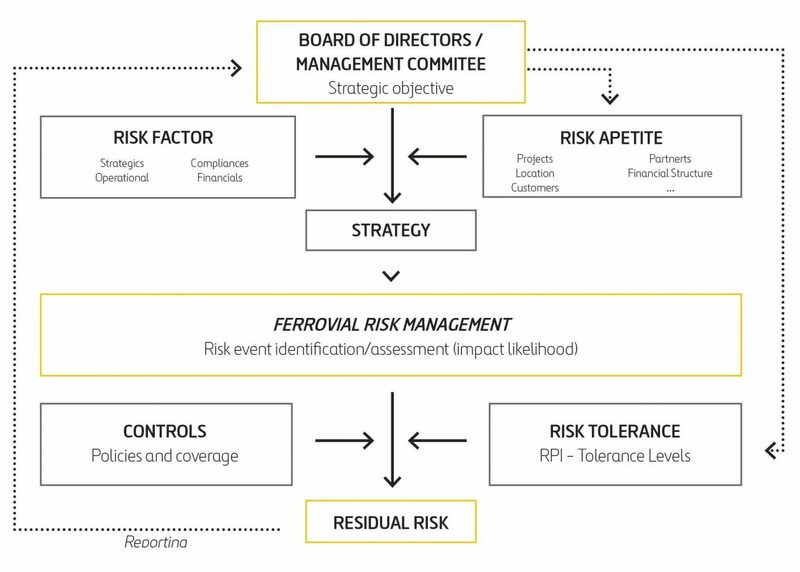 Ferrovial’s Board of Directors has approved a Risk Control and Management Policy to provide all employees with a general framework and guidance on how to control and manage the different sorts of risks they encounter when working towards the company’s business objectives. The policy establishes how much risk is acceptable by risk factor and sets an acceptable level of tolerance. The company has an identification and assessment process known as Ferrovial Risk Management (FRM), which is overseen by the Board of Directors and the Management Committee and implemented across all business areas. This process was created for the early detection and assessment of risk events based on their probability of occurrence and potential impact on strategic objectives. This enables Ferrovial to roll out the most suitable management and protective measures according to the nature and location of the risk. The identified risk events are assessed using common metrics: one inherent, before the specific control measures put in place to mitigate the risk, and one residual, taking into account the specific control measures in place. The appraised difference between inherent risk and residual risk allows the company to determine the relative importance of each risk event in the risk matrix and also evaluate the effectiveness of the measures implemented to manage those risks. For further details, please refer to section E of the Annual Corporate Governance Report. Explanatory note: the closer a risk is to the diagram's center, the more serious it is. The circled areas indicate tolerance levels. Risk events that threaten several strategic priorities have been placed in the section with the highest relative importance. Below is a description of the most relevant risk events, and a list of the main control measures implemented to mitigate their potential impact and/or probability of occurrence. CONTRACTUAL DISPUTES The budgetary constraints facing some of the client’s public sector clients are hurting their ability to invest and are increasing exposure to the risk of contractual disputes on construction projects, which can negatively impact the return on investment. A prime example of this is the dispute currently ongoing with Birmingham City Council (United Kingdom). As at December 2018, the company had posted provisions in the amount of GBP207 million to cover any liability eventually deriving from the dispute. For further information, please see Note 6.5.1 of the Consolidated Annual Financial Statements. 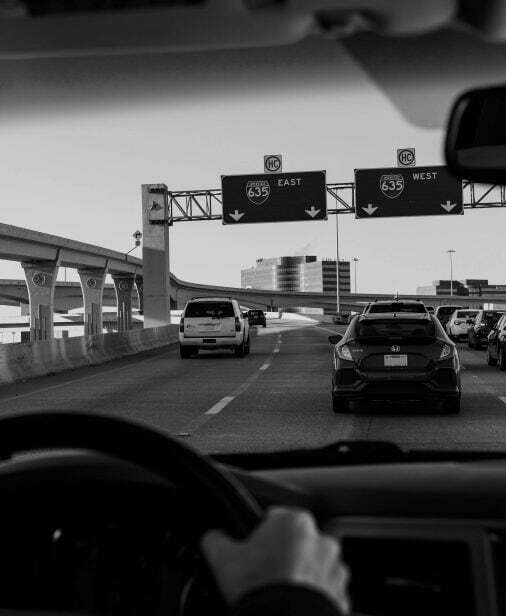 Meanwhile, the complaint brought by SH-130 Concession Company, LLC (United States) against the construction company, which is 50% owned by Ferrovial, alleging construction defects, continues to progress through the preliminary stages. In tandem with this claim, the concessionaire filed suit in March 2018 against the previous concessionaires (Ferrovial and Zachry) claiming breach of their trustee functions. See Note 6.5.1 to the Consolidated Annual Financial Statement. High degree of legal security in the regions and areas where projects are undertaken. Establishing contractual and safeguards and financial guarantees needed to safeguard the company’s interests. Active management of project risks. PRESSURE The economic slowdown in Europe and the financial difficulties facing emerging countries are negatively affecting public sector investment capacity and, by extension, business opportunities in those parts of the world. This situation has pushed capital flows towards more dynamic markets with greater investment capacity in which Ferrovial operates, increasing the competitive tension and the consequent pressure on prices and margins in projects in which risks transfer of is not balanced. The portfolio of technical references and the availability of partners with technical and economic solvency are also affected. Effective risk management affords the company competitive advantages when bidding on projects. Investment approval procedure whereby the company identifies and assesses the most relevant project risks and picks only those for which there are suitable risk management capabilities and which provide a genuine competitive advantage. The bidding activity focuses on technically complex projects in which the effective management of risks becomes a differentiator factor. Statements note 5.4 There is now considerable uncertainty as to whether the British Parliament will ratify the deal reached between the European Union and the UK government to implement a two-year transition period starting 29 March 2019. It is unclear what the economic and political ramifications of this precarious situation for both the UK and the EU will be. The resulting impact on Ferrovial’s assets in the United Kingdom (14% of the value of its total assets according to analysts’ estimates) could affect the company’s overall profitability and ability to create value. In the case of Heathrow Airport, a possible stagnation or slowdown of the British economy is not expected to have any major impact on its business due to the importance of the asset and because it is already operating at full capacity. On top of this, the British government’s support for the plans to build a third runway illustrate the airport’s importance to the country, making it somewhat less exposed to the risk of Brexit. Heathrow has released a report on the potential adverse impact in the event of a hard Brexit wiping 114-million-pound from the Budget for 2019. Meanwhile, S&P has announced its intention to maintain the airport’s rating but with a negative outlook. Continuous monitoring of the ongoing negotiations between the UK and the EU. Operational efficiency measures to be implemented across the various business units to respond to new market conditions. Continuous monitoring of the financial markets in order to hedge risks accordingly. Arranging hedge agreements to cover an amount roughly equivalent to the dividends expected to be received from UK assets over the coming three years. FACTORS Ferrovial carries on its business in stable regulatory environments with high levels of legal certainty. However, political instability in certain regions in which the company operates can lead to regulatory changes that would negatively impact asset management and expose the company to new risks. In the specific case of Spain, growth prospects may be affected by political instability and uncertainty derived from political and social initiatives in Catalonia calling for the separation of the region from Spain. Meanwhile, the political situation in the United Kingdom and the precarious position of its current government may well impact the planned expansion of Heathrow Airport, which was greenlighted by the British Parliament in June 2018 and which is continuing through the public consultation process eventually leading to the approval of the Development Consent Order. Permanent monitoring of any regulatory or legislative processes that may affect business, as well as possible political developments, in order to anticipate possible changes and manage them accordingly. CYBER-ATTACKS Ferrovial’s infrastructures are vulnerable to cyber-attacks, which would impact people and the infrastructures themselves and could even paralyze operations. The assets most exposed to this type of risk are our airport and road infrastructures. Collaboration with security forces to implement the most appropriate security measures and systems to prevent attacks on company infrastructure. Cybersecurity measures to reduce the risk of unauthorized access to the company’s information and operating systems. DISPUTES Potential disputes with individual employees or groups of workers can threaten the company’s productive capacity, especially in relation to more employee-intensive activities. Continuous collaboration and contact with workers’ representatives to forestall possible conflicts sufficiently in advance so that preventive measures can be adopted. Adhering to current labor law and regulations and ensuring strict compliance with the labor agreements in place as a means of mitigating the risk of disputes with employees. DISASTERS Unexpected events that result in damage or injury to individuals or property, and located at or caused by assets owned and/or managed by the company, including natural disasters. Contingency plans for each type of event. Health and safety systems to be implemented in all areas of activity. Insurance policy with coverage and compensation limits for accident liability, including environmental risks, events triggered by terrorist attacks or sabotade against company-managed facilities and infrastructure. SERVICE QUALITY Breach of quality levels and/or delivery times agreed upon with third parties. Inadequate or insufficient quality assurance systems for goods and services provided by the company. Quality policy, quality management system by business area (ISO 9001) and implementation of key indicators to measure quality levels during project performance and provision of service. Audit plan to ensure compliance with the law, regulations, contractual obligations and objectives. Digital platforms to ensure compliance with technical legislation and regulations throughout all phases of the contract life cycle. (For more information, please see the section on the Environment on page 73 and 78) Company activities that can have a significant impact on the environment and the local area in which it operates. Internal and external audit plan (ISO 14001 and EMAS mainly) to ensure compliance with the law, regulations, contractual obligations and objectives. Insurance policy with sufficient cover and compensation limits to meet possible liability arising from environmental risks. Measures to ensure compliance with and awareness of all applicable technical legislation and regulations. (For more information, please see the section on the Environment on page 78) Exposure to risks relating to climate change. Extreme weather events can not only affect infrastructure but also have an economic impact (increasing the cost of raw materials) and technological impact by leading to regulatory developments aimed at reducing polluting gases (higher taxes on fossil fuels, increased cost of GHG emissions, new forms of transport that impact project business plans, etc.). Ferrovial has implemented a process to identify and assess the risks arising from climate change in order to anticipate them sufficiently in advance to be able to implement remediation and adaptation measures in response to the new environment. (For more information, please see the section on Health and Safety on page 78) Because of the nature of its business, the company is exposed to the risk of accidents occurring, which can impact both people and property. Implementation of adequate health and safety systems to safeguard company activities under a zeroaccidents vision. Control and supervision of adequate occupational health and safety conditions at all work centers. Continuous training in occupational risk prevention. Permanent monitoring of management systems through internal and external audits. (For more information, please see the section on Ethics and Integrity on page 74) Actions carried out by employees, with or without the help of third parties, that breach or fall short of the principles governing integrity, transparency and respect for the law and human rights. Ferrovial has drawn up a Compliance Model that embodies the principles of respect for current legislation, ethical integrity, transparency and zero tolerance toward criminal actions. Training on ethics and anticorruption. BREACH OF REGULATIONS AND OBLIGATIONS WITH THIRD PARTIES Breach of regulations affecting Ferrovial. Failure to honor contractual obligations with third parties, which may give rise to penalties or jeopardize project continuity and/or the company’s financial position. FRM process allows us to detect, assess and monitor the risk of non-compliance with obligations early enough to be able to take appropriate corrective measures. Statements note 5.4) Risks associated with changes in financial data, access to the financial markets, cash management, the reliability of financial information and tax-related risk. Assessment and management of the risk exposure of the main financial variables: interest rates, exchange rates, share price, liquidity and credit. This analysis draws a distinction between the policies applied at infrastructure project companies and those applied at other companies (where this difference is deemed relevant). 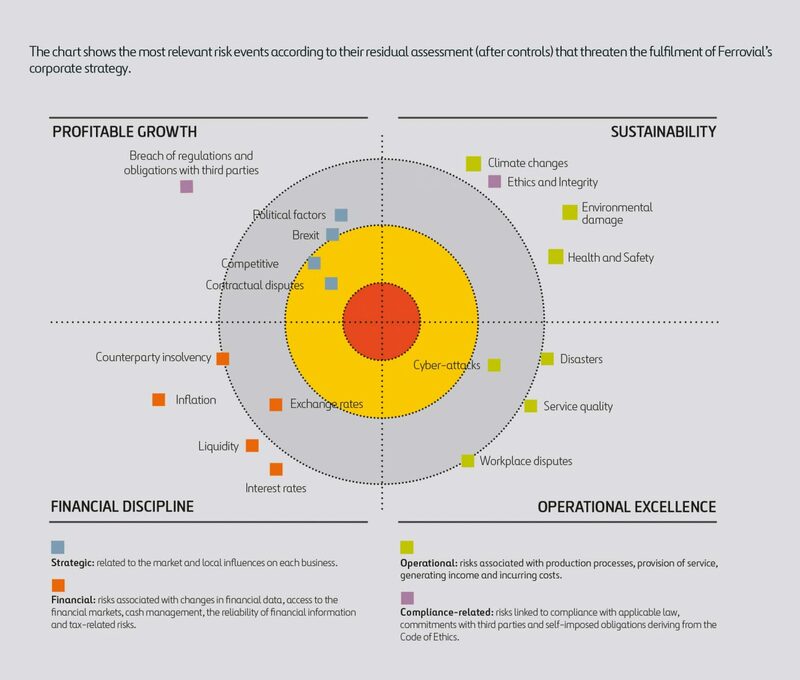 Meanwhile, Ferrovial pays close attention to any emerging risks that might impair its ability to meet its strategic targets. This also extends to risks which, despite having a low probability of occurrence, could nevertheless have negative effects on its business targets. Some of the more prominent risks here include natural disasters or risks caused by human action, humanitarian rises, anti-globalization and protectionist political movements that have the effect of reducing international investment and jeopardizing free competition, or causing technological disruption and/or obsolescence and impacting technology innovation when it comes to infrastructure management.